Manuel Obregon, Minister of Culture of Costa Rica paid a visit to San Pedro Town on Saturday as part of his unofficial meeting with Honorable Manuel Heredia Jr., Minister of Culture in Belize. 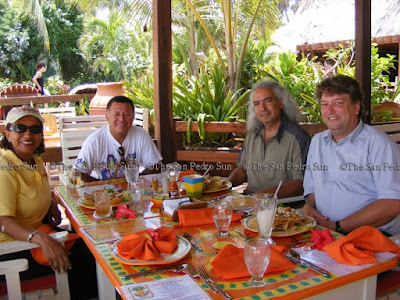 While on the island he enjoyed a delicious meal at Pineapples Restaurant at Ramon's Village. He was joined by Dianne Haylock, President of the National Institute of Culture and History and Ivan Duran. Obregon, an accomplished piano player, performed his simbiosis concert with images of the rainforest at the Bliss Center on Saturday night. On Sunday, he took part of the tribute concert for Belize's King of Brukdown, Mr. Wilfred Peters.